Edit: btw, if you are experiencing connection problems on port 6667, try 6668 or 6669. Somehow whenever 10 people connected , the others will get tcp connection refused. I'm guessing this is either something wrong with my router, or its our "beloved" TMNET have done something fishy on upstream routers/squids. Me, being myself, had just noticed from Max Spevack's post about FUDCon video, that torrents.fp.o have a collection of FUDCon videos from previous conferences. It's a habit of mine, where I would usually simply skip through stuff when I'm looking for something specific on a page (I love ctrl+f). I've dropped by at torrents.fp.o several times last year, grabbed the ISO torrent, and left without looking at anything. I didn't notice the Boston FUDCon vids torrent are at the bottom of the page. Deluge fired up, leeching away~!! I've been spending today trying to spin a minimal Fedora liveCD as a base for spinning various of other custom spins for easing future stuff, and for fun. The package list was based on Ubuntu-Minimal metapackage dependencies (of course, with some modification) and I'm using Revisor 2.0.5-15.fc8 for building the CD from a kickstart file. Dropping to a shell. Good luck! I have sysvinit in the kickstart and checking in the image file (after mounted them) /sysroot/squashfs.img/os.img/sbin/init is there. I'm still waiting for Kaeru to post a blog about it as he has the most details. But here's my part of the story. It was very interesting to be there where we actually get first hand information about the blind's concerns about accessible websites and softwares, income opportunities, technical skills, etc. There are blinds who have a high technical capability but their talent are ignored due to their condition. Orca works great too, though we haven't field test it yet. The GNOME HIG helps for making applications accessible and that is great. However, as usual, the voices are monotonous. It would be great if we can have clearer and nicer voices. My industrial internship with Inigo Technologies requires me to run a distro which have python2.4. Being someone who prefer to stick on RPMS rather than source-based installation, I ran CentOS on Xen of my home fileserver for Zope/Plone support. While wasting my time browsing through pirut a few days ago, I noticed compat-python/compat-zope/compat-plone on Livna repository. I know those packages exist by Jonathan Stefan, but didn't know that its on Livna. Anyway, cool, now I can play with zope on my laptop directly :D.
Somehow, I don't feel quite happy about the announce. Naming of Fedora releases have been running in quite a fun manner since its started going public not so long ago. The name game starts only when the next release of Fedora almost done, suggestions come, voting was made (in approval voting - NOT the Pick-Only-One voting like the recent F9 name vote). The vote results remain secret and contributors wait anxiously for what name the winner going to be until a few days before release. And once it got official, the name got out not through announcements, but from people who saw fedora-release was changed in cvs commits!!. My beloved R51 which I bought almost 3 years ago is suffering of old-age. It processor heats up quite fast to 80/85 Celsius and sometimes triggered shutdown alarm on 90C. The temperature during idle is around 50C, which is pretty hot. Adding external fan and overriding the speed of the internal fan doesn't help much. cpuspeed in Fedora by default only turns on the default scaling governor and didn't do anything else. You will need to configure it through /etc/sysconfig/cpuspeed. Remember to set the Governor to "userspace" or your cpuspeed will not be started through the init script. Following the post I've made about the MicropolisCore package, I've packaged micropolis-activity. http://svn.debian.org/wsvn/pkg-games/packages/trunk/micropolis-activity/debian/patches/. (Thanks to Rahul Sundaram for notifying me about this). The game is running but i didn't test it much. There are some segfaults when loading certain maps. The dependency list might also not be complete. 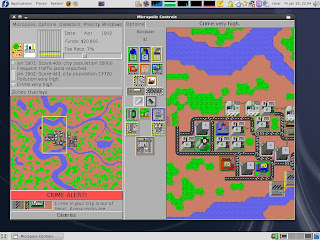 Here a screenie of it running a saved city from the the source tarball. The recent gmirror failure on Gambit caused us to switch to automated dump and tar instead. Our requirement was like this: Full backup on Mondays (around 3-5am) with daily incremental backups relative to the Monday backup. Whenever a full backup is being performed, the previous backups must not be overwritten until the full backup is done. inigo-disk-dumps.sh - an incremental live dump script using FreeBSD's Dump - now, I wish Linux's Dump have live dump support. gnu-tar-incremental-backup.sh - an incremental tar backup script using GNU's Tar - I wrote this before the FreeBSD's Tar script on my Fedora laptop, but was surprised that FreeBSD's Tar doesn't have --listed-incremental option (-_-)". For the scheduling, I just use cron. Do inform me if you have suggestions to improve the scripts or if you found any risky bug it in. <evil_steve> oh come on. THey GPL'd Sim city 48 hours ago and it's *not* packaged and in repos yet? * KageSenshi now waits for simcity4k to GPL ..
<evil_steve> KageSenshi: let me know how you go. Yay to Free/OpenSource Softwares!!. The original SimCity is now GPLv3+!. From the way it looks, I believe it was released to make it as an Activity for the OLPC XO. Nevertheless, it can be compiled and run at our normal desktop linux. My blog just included in Planet Fedora. Yay! (/me jumping with joy). Thanks Seth Vidal!!. A little introduction about myself and Linux. Yesterday I was at JCKL for my weekly ninjutsu class. When I was passing by their computer lab, suddenly something caught my eyes - "Flying High" and "Fedora Bubbles" !!. The users (some grownups, some children) who are using the computers seems happily browsing the Internet and using OpenOffice. And they didn't look like having trouble using it. One of the children was also doing something with The GIMP!. Linux is spreading slowly but far, hidden from the eyes of general public (^o^). Lets keep it going!. All hail to the Penguin! Max Spevack just made an announcement today. Paul W. Frields will be the next FP.O leader, effective this February. By default blogspot shows 20 posts for the blog feed, however, this might not be desirable to some people (eg: those who are aggregated on Planets and hated when a minor edit to an old post causes the post to be bumped to the top of the Planet). Gladly that Blogspot feed URL have an optional feature to reduce the returned post quantity on the feed, though its not displayed in the default blogger.com dashboard. p/s: dont bother opening that url, as you'll be redirected to my feedburner feed, but hey, you got the idea right? Open ``Appearance and Themes > Style`` and change your KDE style to one with better looks, apply and save it. Guess what .. Rawhide eats me right after installation .. I cant login in X .. seems like everytime Xorg resets, modechange, or quits, the whole computer locks up..
Now I'm back to the safe side with Werewolf. I will give Rawhide another shot when theres another rawhide spin or after F9-alpha is released. Hope Xorg doesn't eat me again that time. One of the least known feature in RPM is that it has a rollback feature. This allows you to rollback any updates you have done to your installed packages. Quite useful if a recent update broke your system. If/when you want to rollback to a previous state, perform an rpm update with the –rollback option followed by a date/time specification. Some examples: rpm -Uhv –rollback ‘9:00 am’, rpm -Uhv –rollback ‘4 hours ago’, rpm -Uhv –rollback ‘december 25′. For the past month, I have been working as an intern at Inigo Tech. The company focuses on Zope and Plone deployment and customization and I'm the sysadmin of the company server. The company server uses FreeBSD as the OS with several BSD Jails on top of it. BSD Jails is one of the virtualization technology on the OS level. Unlike Xen, Qemu and VirtualBox, Jails is a very lightweight virtualization where the Guest environment does not run any kernel on it. While Xen, Qemu and VirtualBox allows different OSes running as Guest, Jails can only support another BSD installations.